VATICAN CITY (CNS) — Pope Francis wished a happy 90th birthday to the “father of liberation theology” and thanked him for his contributions to the Catholic Church and his love for the poor. 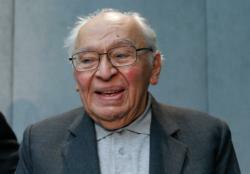 Father Gutierrez, a Peruvian, is one of the principal founders of liberation theology, which rose to prominence in South America in the 1960s and 1970s as a way of responding to the needs of Latin America’s poor and as a call for freedom from unjust social structures. In the 1990s, the Congregation for the Doctrine of the Faith, then led by the future Pope Benedict XVI, expressed concerns about some currents of liberation theology, which he said were politicized and relied on Marxist ideas and analyses. Nevertheless, he praised liberation theology’s zeal for social justice and the poor. Pope Francis has followed his predecessor’s line, disagreeing with the movement’s politicization while sympathizing with its concern for the poor.